Starting a small business can be precarious, and success is seldom assured. Entrepreneurship by its nature involves taking the initiative to create something new, or something better, despite significant risks. Patty Bills spent 26 years working for various government agencies, including the U.S. Bureau of Land Management, the National Park Service, and the U.S. Forest Service. But as time passed, eventually she arrived at an unsatisfactory dead-end. Increasingly, she found that her love of art counted for more than the security of a government paycheck. 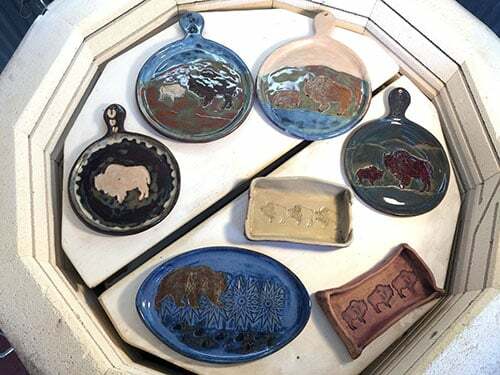 So she left her position with the U.S. Forest Service, and in March 2015, started PDB Bear Pottery Art in her home near Buffalo. 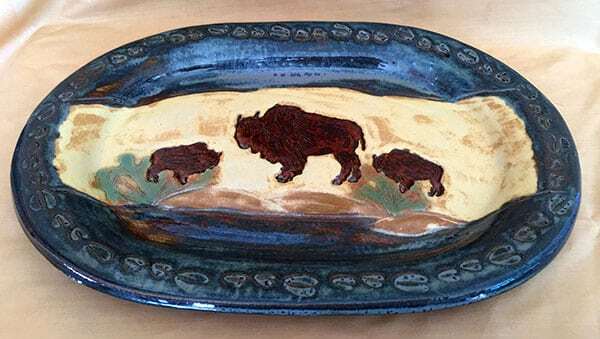 She focuses on pottery and watercolor and canvas paintings that feature wildlife motifs. 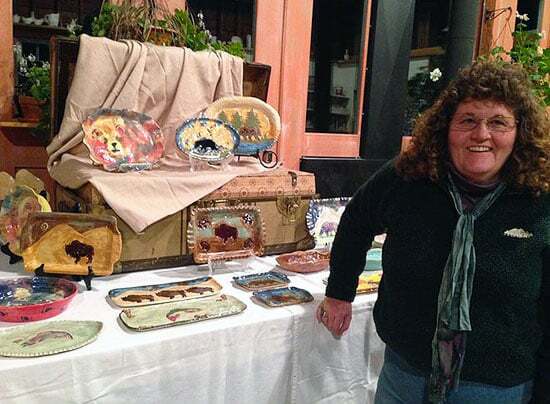 Patty’s handcrafted pottery includes large, flat pieces that might be described as a blend of ceramics and painting. 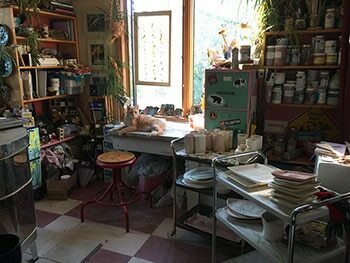 She uses non-toxic glazes, so her pottery is functional in addition to being aesthetically pleasing. It can be heated in a microwave, run through a dishwasher, and used for serving food. A home solar system supplies much of the energy to fire Patty’s pottery. Patty’s artwork is available for sale in stores from Jackson to Rapid City, S.D., and Buffalo to Darby, Mont. She also conducts art classes, including at a youth summer camp in the Big Horn Mountains. Some of Patty’s early success resulted from fortunate circumstances. For example, she secured a spot for her pottery in Skywolf’s Gallery located in Jackson Hole’s Teton Village from a chance meeting at an art show. At the same time, Patty benefited from practical assistance from the Wyoming Small Business Development Center Network. “We just went through the whole start-up process,” said Susan Jerke, the SBDC’s regional director for northeastern Wyoming. She helped Patty address a variety of important matters, including business structure, taxes, and sales projections.  The SBDC also introduced Patty to the “Wyoming First” program, which helps Wyoming business owners promote products that are made in, or substantially enhanced in, the state. Darby, Mont., is a town of about 700 people located near the Montana-Idaho border. Julia Winthers, the owner of Hidden Treasures in Darby and a longtime friend of Patty, said life gets a little dull in her community. So when Patty held a class for novice artists, it was a welcome diversion for the women who attended. Presented with 10 blank canvasses, Julia said the women were able by the end of the session to produce a series of lovely and revealing paintings. The paintings created with Patty’s guidance now hang at the Bandit Brewing Co. in Darby. Throughout the year, Patty conducts watercolor and acrylics painting classes for both adults and children. During the summer, kids are invited to her home for art classes, and for inspiration, they hike along the Clear Creek Trail System. “To me, it’s very important to keep children attached to nature,” she said. Sandy Sare, program manager for the Sheridan County YMCA, said Patty brings the same passion for the natural world to her work at YMCA summer camps. “Patty ties in environmental stewardship – for the hikers, an artist, or a fisherman – along with an appreciation of the natural beauty,” Sandy said. As an outgrowth of Patty’s work with young people, the YMCA also hopes to sponsor art programs for adults. Beyond the content of particular programs, Sandy said Patty also “fits in with all of what we represent within our organization, the core values of the organization – very caring, responsible, honesty, her integrity, her sincerity in working with the kids, and her enthusiasm.”She added, “Patty is filling a need we are really being asked to provide.”Click on the “success stories” to the right to learn about how more Wyoming businesses have found success in the Cowboy State.